When Apple's mother returns after eleven years of absence, Apple feels whole again. She will have an answer to her burning question - why did you go? And she will have someone who understands what it means to be a teenager - unlike Nana. But just like the stormy Christmas Eve when she left, her mother's homecoming is bitter sweet, and Apple wonders who is really looking after whom. It's only when Apple meets someone more lost than she is, that she begins to see things as they really are. Like a brilliant hybrid of Cathy Cassidy and Jacqueline Wilson, Sarah Crossan entices you into her world, then tells a moving, perceptive and beautifully crafted story which has the power to make you laugh and cry. Sarah Crossan has lived in Dublin, London and New York, and now lives in Hertfordshire. She graduated with a degree in philosophy and literature before training as an English and drama teacher at Cambridge University. Since completing a masters in creative writing, she has been working to promote creative writing in schools. The Weight of Water and Apple and Rain were both shortlisted for the CILIP Carnegie Medal. 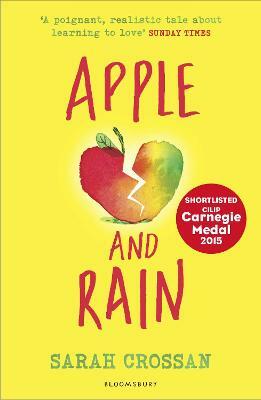 In 2016, Sarah won the CILIP Carnegie Medal as well as the YA Book Prize, the CBI Book of the Year award and the CLiPPA Poetry Award for her novel, One.